Michaela Day addresses a crowd of protesters during the sixth weekly #FreemanFriday protest at the Hennepin County Government Center. Photo by Annabelle Marcovici. Social media lit up on the morning of March 16, as Hennepin County Attorney Mike Freeman announced that his office would no longer use grand juries to investigate cases in which police use deadly force. More specifically, Freeman announced a grand jury would not be used in the case of Jamar Clark, who was shot to death during an incident with two Minneapolis Police Department officers on Nov. 15. The announcement was hailed as a victory for all in the Twin Cities fighting for racial justice and equity. And it certainly is a step in the right direction. Organizers and community members applied enough pressure to Freeman’s office that a major policy change happened without the use of the voting booth or the act of a legislative body. The work that has been going on before and the work that continues in the wake of Freeman’s announcement pushes for so much more than dropping the use of a grand jury in the Clark case. The rallying cries of #ReleaseTheTapes, #ProsecuteMPD, #Justice4Jamar and #BlackLivesMatter still stand, and they need the support of the larger community to start bringing real change to Minneapolis. “The ensuing months [after Clark’s death] have given me more time to think about the grand jury. As an elected official, I also took that time to meet with more people and listen to their concerns. I concluded that the accountability and transparency limitations of a grand jury are too high a hurdle to overcome,” Freeman stated. How did Freeman come to that conclusion? Did he sit and search within the goodness of his heart to find the right answer? Policies don’t often change solely because officials have genuine, altruistic changes of heart. So, let’s give credit where it’s due. There have been concerted efforts from across Twin Cities communities to put pressure on Freeman’s office ever since he first announced he intended to send the Clark case to a grand jury back in November. After the 18-day occupation of the Fourth Precinct, big protests like the Black Lives Matter-Minneapolis (BLM) shutdown of the Minneapolis-St. Paul airport on Dec. 23 and the six weekly #FreemanFriday protests by the TCC4J at the Hennepin County Government Center have been the most visible actions in the fight for #Justice4Jamar. Less visible acts, and just as important, have been the community meetings, phone calls, petitions and many organizing efforts that have kept #Justice4Jamar top of mind for state and city officials in recent months. NOC and TCC4J have had multiple meetings with Freeman and his staff and have also helped bring forward witness testimony from the night Clark was killed. 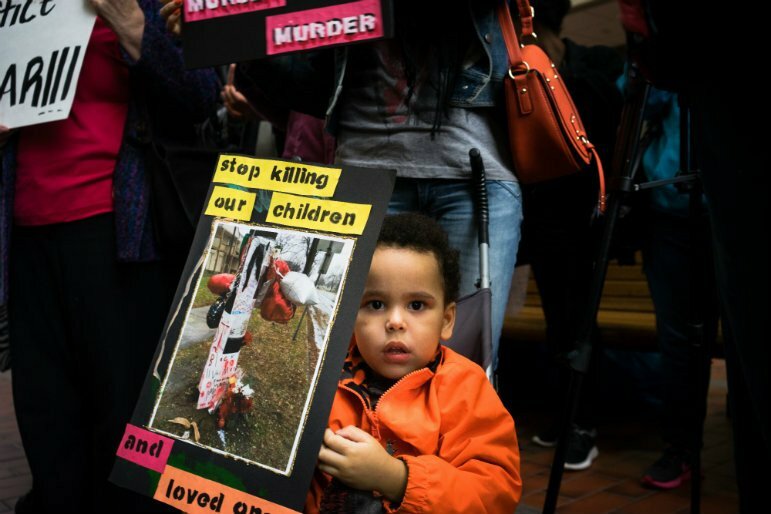 In addition, Neighborhoods Organizing for Change (NOC) spearheaded a petition effort to prevent a grand jury from being used in the Clark case. The petition has seen more than 2,700 participants sign on to the cause. Another key moment in the fight was a Feb. 1 panel discussion hosted by Minneapolis City Council member Alondra Cano. Leaders from NAACP, BLM and NOC spent the evening educating more than 300 attendees why grand juries are ineffective, how they have historically been used to keep people of color down, and what can be done to abolish the practice. But it can hardly be called a coincidence when Freeman holds a press conference the morning after Cook County Attorney Anita Alvarez of Chicago–who covered up the Laquan McDonald case–and prosecutor for the Tamir Rice case Cuyahoga County Attorney of Cleveland Tim McGinty were both voted out of office. Freeman’s incumbency may be valid until 2019, but a five-term politician knows which way the wind blows. “It speaks to a broader conversation in the Midwest. The worst racial disparities are here, not just on the coasts or in the South, but here,” said Wintana Melekin, civic and political engagement director at NOC. Melekin noted that when groups organize together and push for change, the way Assata’s Daughters and Black Youth Project 100 organized within a month to oust Alvarez, it shows the power of the movement. “We have to continue to apply pressure,” Melekin said. Folks in the organizing community aren’t the only ones aware that the pressure has to stay high. As TCC4J organizer Mel Reeves pointed out, Freeman’s announcement wasn’t a concession of defeat. Rather, Reeves said Freeman is “laying down the gauntlet” and challenging communities to show up in support of the cause. “[Freeman] is saying, ‘Prove to us how bad you want this prosecuted. Every justice-loving member of the community should come out. Although he said the word, he is not talking about democracy [when he made the decision]. This is not just about transparency, this is about justice,’” Reeves said. When Freeman said, “I will make the factual determination whether there is sufficient evidence to support a criminal charge against the police officers in the tragic death of Jamar Clark,” and touted the need for transparency as one of the key factors in his decision, he simultaneously washed his hands of any blame should he decide not to prosecute. Without the shroud of a closed-door grand jury proceeding, he can claim transparency in the Clark case, and he can seemingly rack up “brownie points” for abolishing grand juries county-wide in cases where police use deadly force. “He thinks he’s throwing us a bone. He thinks, ‘We’re giving y’all this, now shut up.’ But we’ve got to tell him that we don’t want a bone, we want the meat,” Carroll said. And there are plenty more meaty demands from the community still awaiting redress. Of the standing demands that BLM made since the Nov. 15 shooting, only the demand for involvement of federal investigators in the case has been met. Demands such as the termination of the officers involved in the shooting, Mark Ringgenberg and Dustin Schwarze (who currently hold MPD desk jobs), and a public release of the security footage that are evidence in Clark’s death have been largely ignored by city officials. And really, Freeman’s move to ban grand juries was not that revolutionary. The system has been broken for years, and critics have long been calling it out. So, what is a grand jury and what does it do? As Freeman stated, in Minnesota, a grand jury consists of 23 randomly selected adults who are chosen to decide whether or not there is probable cause to indict, or charge, an individual for a crime. The grand jury proceedings are closed to the public. During the proceedings, witnesses are questioned both by the prosecutor and then independently by grand jury members. The grand jury also reviews related documents and videos. If the grand jury decides there is probable cause, it issues an indictment and the case is then prosecuted in public, by the county attorney. If the grand jury doesn’t find probable cause, the case ends, just as it did for Michael Brown, Eric Garner and Tamir Rice. There is no legal requirement to call for a grand jury in cases where police use deadly force. By law, the only time a grand jury is automatically invoked is in cases of first degree murder. Invoking grand juries when police use deadly force is a matter of policy, decided at the county level. The tricky part is the prosecutor is the one who educates the grand jurors through the indictment decision-making process. As FiveThirtyEight reports, bias on both the jurors’ and the prosecutor’s part plays a role in whether grand juries indict police officers. “Perhaps prosecutors, who depend on police as they work on criminal cases, tend to present a less compelling case against officers, whether consciously or unconsciously,” wrote FiveThirtyEight’s Ben Casselman. Grand juries are particularly problematic in Minnesota. Unlike other states, even the transcripts of grand jury proceedings are not available to the public after the grand jury delivers its decision and completes its investigation. “Grand juries are deliberately secretive and have long been ineffective. They have been used to oppress,” said NOC executive director Anthony Newby during the Feb. 1 Café con Alondra panel. Last December the Star Tribune reported that since 2000, 142 people had died as a result of Minnesota law enforcement using deadly force. None of those incidents resulted in a grand jury indictment. In Hennepin County, the policy for calling a grand jury when police use deadly force has been in place for 40 years. Freeman has been Hennepin County Attorney for 18 of the past 40 years. It’s important to note that Freeman has not disavowed the use of grand juries. He has only stated they will not be used in Hennepin County. Even as Hennepin County has dropped the use of grand juries in cases of police using deadly force, almost every other county in the state uses grand juries as the standard. In February, a Ramsey County grand jury failed to deliver an indictment of St. Paul Police Officer Rich McGuire over the death of Phil Quinn, a Native American man who was shot in September while suffering from a mental health episode. The morning after Freeman’s announcement on March 17, Cambodian man Map Kong was shot and killed by Burnsville police for allegedly brandishing a knife in a McDonald’s parking lot. The case is still being investigated, but Dakota County has had a policy of using grand juries in police shootings since 1990. “Our struggle is ignored. When it’s a white person, and especially a police officer, on trial, the proof has to go above and beyond what it would be for a black person to prove them guilty. Black folks are subject to a much lower standard to prove guilt,” Melekin said. 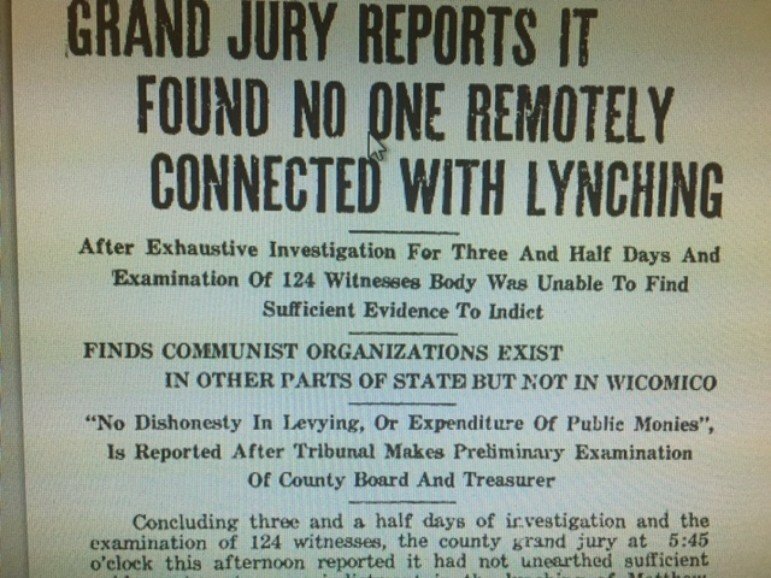 Headline from The Salisbury Times, March 18, 1932. Photo courtesy of The Washington Post. 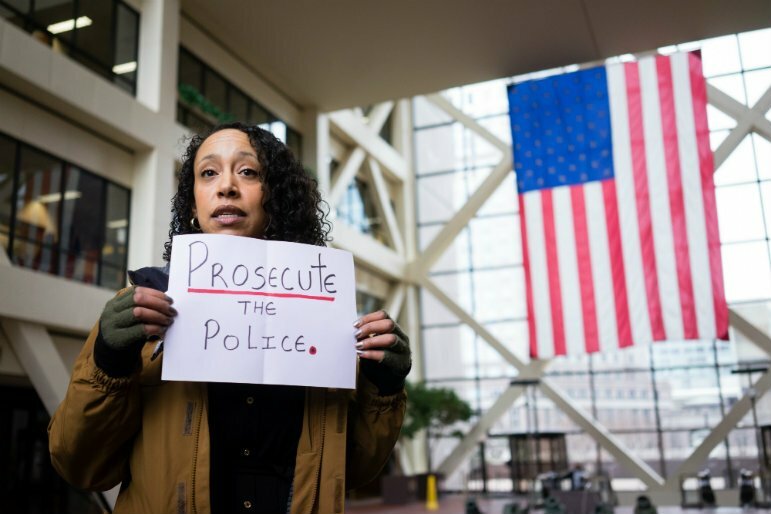 Rose M. Brewer, an African American studies professor at the University of Minnesota, said the discussions around prosecuting the police and the use of the grand jury are linked to the origins of policing. Brewer said the earliest forms of policing come from the old “posse” model, when violent groups of white men were sent out to recapture slaves or commit genocide upon Native Americans, thus building an an economic and power structure based off of exploitation. How can such a system bring a just and fair judgment when its own officers have perpetrated violence against communities of color? California, in an act by its state Legislature, is the only state that has banned the use of grand juries in cases of police using deadly force. Minnesota could be the next. NOC has put forward a similar resolution. The resolution passed numerous party precinct caucuses on March 1, and with continued support the measure could appear on Minnesota party platforms later this spring. Organizing is also being done at the Minnesota Legislature to propose a bill abolishing grand juries in cases of police using deadly force before the session ends on May 23. The Jamar Clark case has the potential to set precedence that will make lasting changes in Minnesota’s judicial system. If Ringgenberg and Schwarze are prosecuted, and the grand jury is banned statewide in cases when police use deadly force, Minnesota has a chance to do right where other jurisdictions have failed. The only way we can move forward is if the community keeps the pressure on Freeman’s office, county attorneys across the state, the state Legislature, Gov. Mark Dayton and even the state’s federal politicians. TCC4J will hold a rally on March 26 at the Hennepin County Government Center to demand that Freeman’s office #ProsecuteMPD. The rally starts at noon. In addition, our politicians need to hear from us. Find who represents you and their contact information here. Dayton can be contacted at 651-201-3400. No justice, no peace. Prosecute the police. This week: No justice from MPD investigation of officers in the case of Jamar Clark, UMN group Compass advocates for LGBTQIA business students and "Durades Dialogues" at Mia highlight African-American artists. 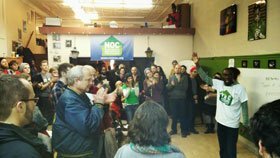 Nearly 200 community members gathered at the Neighborhoods Organizing for Change office for a forum on workers' rights in Minneapolis and throughout the state, including a need for earned sick and safe time, fair scheduling, a living wage, and ending wage theft on Saturday, February 28. "When I was working at McDonald's, I had a baby and had to go back to work ten days later or lose my job--even though I had a C-section," said Octancia Adams, an organizer with Neighborhoods Organizing for Change. "They wouldn't give me paid time off.